A few weeks ago, I told you how easy it is to get great photographs by shooting outside on an overcast day. Well, we can’t always get outside, can we? Whether the weather is bad or we don’t want to move all our stuff, there are times when it just makes more sense to stay indoors. But that doesn’t mean that lighting has to be complicated, or that you can’t get a great shot with a very simple setup. 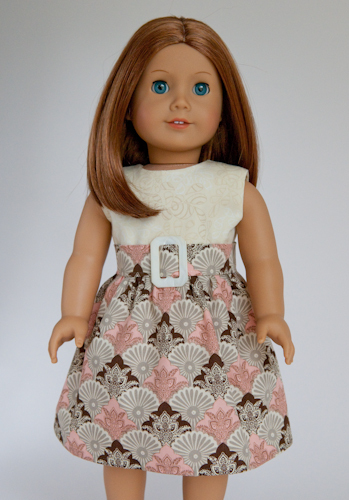 For today’s example, I’m going to use one of wife’s doll dresses that she sells on Etsy (shop name PattiKuz). She creates her own designs, makes her own patterns, does all the sewing and ironing, and then shoots most of her work indoors. Here’s a sample of one of her dresses. Take a look, we’ll discuss it a bit, and then I’ll tell you how it was done. See, I took out all the complicated stuff and we’re left with what? Natural lighting, of course. The shot was just taken this morning. The sun was up but still pretty low in the sky. The sky was overcast to the point where it was difficult to see any shadows from trees or buildings outside. Our house has this room with one large, south-facing window. Take a look at the drawing below to see how the shot was set up (click and zoom to get a better view). You see, the only light source was indirect daylight coming in through the window. But the white background (which, by the way, curved seamlessly under the dolls feet) and the homemade aluminum foil reflector (foil wrapped around a thin cardboard box) was enough to make it look almost as good as a studio lighting shot. This is without a doubt the easiest, least expensive way to get good indoor shots. Try it! Don’t be afraid to experiment. Try different windows and times of day. Try different reflector sizes and positions. Play with different background materials. And don’t forget everything your learned in my “Get the Blur Out” post. Great post Gpix, I like how you listed the things you did *not* use. 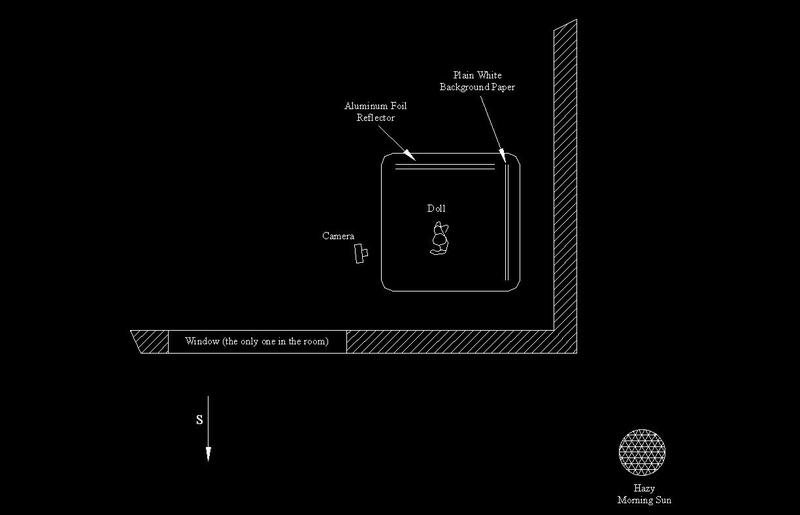 The diagram with the setup very useful. Thanks for all the info! I’m just relearning again how to do my shots after moving to ceramics. Was easy with wood…but glossy ceramics is more difficult. My windows are all North-East. Is it possible to get good results indoors? For some reason, my indoor product photos have some nasty bluish tone which I don’t know how to get rid of… Will aluminum screen help to solve this problem? I just looked at your shop, and I think you’re doing a great job with your photos. Sure, some could be a little better, but overall they are very clever and well done. Regarding your indoor shots, they could be a little warmer. If you choose one particular shot you’re not happy with, we can address how to make it better. In fact, if you email me the original image (without any editing) I can tell you if your problem is the camera settings or the room lighting. Thank you very much, gpix! Where can I find your e-mail address to send a picture? Yes, I suppose it would have been helpful to give you my email address! It is mikekuz@gmail.com. I’ve been thinking — with your permission, I’d like to do a post with before and after shots of one of your items. Send me a photo of something that you’re really proud of making, but are also unhappy with the photos. Then we can work together to come up with improved photos. You can edit your item to include the new shots, and I’ll publish a post comparing the before and after shots describing the changes you made. I think it’s a great idea which would be great for my shop and, I believe, for many other Etsians who also want to learn how to take good photos and improve the current ones. Please expect the original (oh, ugly) pictures by e-mail.